180 gram vinyl limited to 500 copies. Vinyl artwork is exclusive to this release. Dutch "post-black metal" band formed in 2008 after the dissolution of their previous band "Liar Liar Cross On Fire". The album focuses on the problem of self. Six tracks explore different ways to live, or fail to live, with self and world. They embody the struggles these paths and strategies create: blindness, suffering, a desire for release, the destruction of self and others as well as the turning towards -oraway from- life. Self as prison, self as a source of power, self as vessel for manipulation by outside forces, self asshield and as inner world, self as medium for Dionysian rapture, self as something to be overcome. In the six songs that constitute Self, the rage of black metal is paired with a cathartic destruction as well as a contemplative, sometimes crawling melancholy. Instead of navel gazing or the worshipof constructs, Self is analysis forced. A cerebral celebration of liberation at all costs and a requiem for spheres rendered apart. 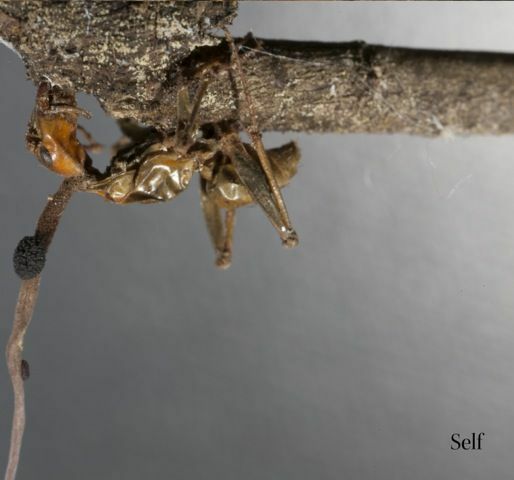 The artwork of Self depicts ants, consumed by cordyceps. These parasitic fungi appropriate the brains of whichever host they infect, to manipulate and effectively destroy its self-regulating features. Through this annexation, the ants become empty shells of what they once were, governedby a destruction from within, imposed and irreconcilable.